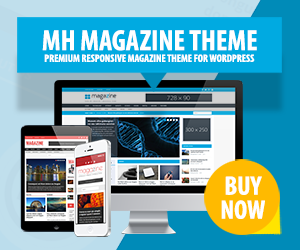 Music WordPress themes are usually highly flexible, dynamic and creative templates for all kinds of different music websites. Specific features, tools and options related to music are useful and essential if you want to run entertaining music portals, promote certain types of music or your own band. In case you are running your own online portal to download and listen to songs and albums – music WordPress themes can be perfectly suitable as well. High-quality music WordPress themes are rare and thus we’ve collected some of the most popular ones. When searching for music WordPress themes, look out for a few essential features which will make your life easier when running music websites. Music WordPress themes should be responsive for your content to appear organized on all kinds of screen size resolutions. Furthermore music templates should offer good working video and/or audio players of high quality and event calendars to display latest events or concerts. To keep in touch with fans and friends, social media integration is of great importance as well. WordPress is an awesome platform to create flexible websites and thanks to thousands of great WordPress plugins you can extend your website functionality. In case you think about integrating an online shop on your music website to sell all kinds of band t-shirts, cups, posters or other fan articles, make sure you choose music WordPress themes which are compatible with popular plugins like WooCommerce. The same applies for the integration of community networks, forums or else.